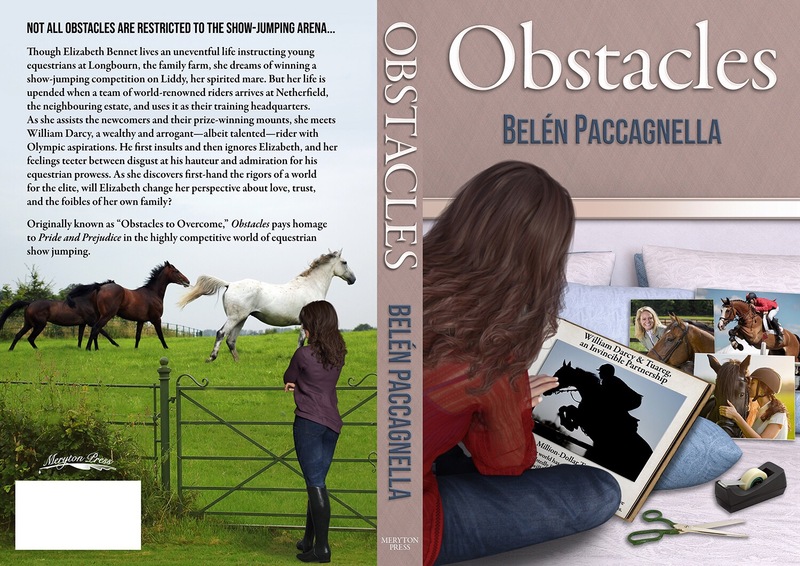 After having launched the blog tour of Obstacles with the cover reveal on the 30th of August, I’m very happy to receive Belen Paccagnella at From Pemberley to Milton once more. This time Ms. Paccagnella is bringing all of you a very informative excerpt, and I don’t know if you will have the same reaction I did, but I was definitely surprised with what I was reading. I don’t want to spoil the excerpt for you, but I was not expecting Darcy and Elizabeth’s relationship to be already at this stage in the excerpt I would post, it certainly made me even more eager to read this book. I also liked Kitty’s story and how the sisters discussed their involvement in the farm, it seemed very real and it capture my attention. Even if it is not regency, my favourite era, this is a book I will definitely be reading in the near future. Not all obstacles are restricted to the show-jumping arena… Though Elizabeth Bennet lives an uneventful life instructing young equestrians at Longbourn, the family farm, she dreams of winning a show-jumping competition on Liddy, her spirited mare. But her life is upended when a team of world-renowned riders arrives at Netherfield, the neighbouring estate, and uses it as their training headquarters. As she assists the newcomers and their prize-winning mounts, she meets William Darcy, a wealthy and arrogant—albeit talented—rider with Olympic aspirations. He first insults and then ignores Elizabeth, and her feelings teeter between disgust at his hauteur and admiration for his equestrian prowess. As she discovers first-hand the rigors of a world for the elite, will Elizabeth change her perspective about love, trust, and the foibles of her own family? Thank you, Rita, for inviting me to share this vignette with your readers. It’s a piece I created to share a little more about the Darcy’s relationship as Elizabeth after the final chapters close on Obstacles. I had a lot of fun writing this piece and I hope your readers enjoy a little more of the Darcys! “I can’t believe it.” Elizabeth hung up the phone with a loud, dramatic exhalation. She closed her eyes and allowed her head to fall back against the couch. Why? Why did it have to happen right now? Just when everything had slowed down at Pemberley, Longbourn was a mess. It began a couple of months ago with a call from Kitty saying that her parents had had a terrible fight where one blamed the other for all the things that had gone wrong at Longbourn during their thirty years of marriage. Thomas had endured his wife’s ‘new calling’ as Meryton’s resident tarot-card reader because it helped pay the bills, but hearing her calling herself ‘Madame Fanny’ had been too much, and the separation became inevitable. ‘Madame F’ had slammed the door with a “stay with your horses and your bets” and began a new life in Meryton. And now, when Elizabeth was finally learning to live with her parent’s break-up, her sister told her that Phil was also moving out, claiming that he was tired of Kitty and the children and of looking after a farm that no one seemed to care about. “Why? Why now?” Elizabeth sighed. Elizabeth opened her eyes and saw her husband staring at her with a half-smile. He was still in his riding clothes. She exhaled heavily, and he chuckled at her tendency to always make things bigger than they were. Darcy lay in bed next to his wife, staring at the ceiling of their bedroom as images of the past months came one after another. What a year this had been. It started with Miss D’s sudden death. An unexpected infection had weakened her condition, and her heart failed just when they were starting to feel hopeful about her recovery. The sorrow he felt upon losing her had been great, but at least they managed to breed her through embryo transfer, and Miss D left a legacy that would prolong her existence. Then, when they least expected it, Elizabeth announced that she was pregnant. At that time, he was training for his first Olympic Games and jumping qualifying rounds all around Europe. He and Elizabeth had agreed that they would be together all the way, so after the miscarriage she had suffered soon after their wedding, the decision to have a baby was postponed until after the Games. But it happened before that, and they couldn’t be happier. Taking every precaution, Elizabeth was there with him. The madness of the competition came and went, and they were able to return home for that well-deserved rest. A few weeks later, when everything seemed to finally settle down at Pemberley, tragedy struck again: the accident that put him through surgery on his right knee. He was training a new horse, and a collision against a hurdle cut the cruciate ligaments inside his knee. And Elizabeth, entering her sixth month of pregnancy, was watching it. He truly admired her strength when faced with adversity. Darcy had been terrified when it occurred. Not about the injury or the surgery; no, he had been afraid that something might happen to her or the baby because of it. The doctor said that she was all right, that the shock didn’t affect her or the child, but Darcy was very much aware that his wife was facing too much stress for someone in her condition. She needed calm and stability and nothing was helping. Olympic Games, parents breaking up, accidents, and the ghost of her previous miscarriage were always there to haunt her, to haunt them. And now this. When everything seemed right at Pemberley, crisis at Longbourn again. Darcy turned his face to the side and observed his wife while she slept. She was pouting. Elizabeth always pouted when she slept. He rolled to the side and mirrored her position. He touched her cheek and then her belly. She was all right. Only then did he close his eyes and fall asleep. “Is your knee bothering you?” she asked as he drove towards Meryton. “If you’re tired, we can stop.” She rubbed his thigh. “No, it’s OK.” Elizabeth turned her eyes to the landscape. She sighed heavily. “Do you know what I was thinking?” She chuckled. “What you said to me that day at Rosings. That thing about my family being dysfunctional. The couple arrived at Longbourn by tea time. Thomas wasn’t home, and they found Kitty watching TV in the living room. The house was a complete mess, with toys and child’s clothes spread all around and carton boxes of uneaten take-out covering the table. Kitty’s personal appearance wasn’t any better. The state of her hair and clothes was clear evidence that she had not cleaned up in a couple of days. “You look big, Lizzy, when are you due?” Kitty greeted her dully. “And the kids?” Darcy enquired. The sisters walked into the kitchen and Kitty put the kettle on the stove. Elizabeth’s frown accentuated at the sight of the greasy pans and dirty dishes accumulated on the sink and counters. Kitty’s idleness had taken over the entire house. “Kitty, what is going on? What happened?” Elizabeth asked as she sat at the table. “Do you really want to know?” Kitty’s smirk was charged with bitterness. Kitty’s eyes opened wide. She just stood there, staring at her elder sister without uttering a word. “Will, hi.” Phil walked into the house. With one hand he pushed the pram where little Mathew was fast asleep, and with the other, he was holding Cecilia, also dormant with her head leaning on her father’s shoulder. “Let me help you with that.” Darcy rose and grabbed his goddaughter. Cecilia made a noise as she went from her dad’s hands to Darcy’s but didn’t wake up. “Let’s get them to bed.” Phil whispered and gestured the stairs. They left the children in their respective beds and quietly returned to the living room. Neither Darcy nor Phil were prone to inconsequential chit chat so they went directly to the point. Darcy listened quietly and waited until Phil felt comfortable enough to speak on his own. And when he finally did, the young man didn’t hold back. The fiery yelling that came from the kitchen put a pause to their conversation. The men exchanged glances, both knew better than to stand in the middle of fight between two Bennet women. Kitty started laughing and Elizabeth laughed too. “No, Jane’s the angel, I’m your conscience.” Elizabeth smiled. “I … I think that my water broke.” Elizabeth sounded scared. “Yes,” Elizabeth smiled with apprehension. Kitty’s water broke two weeks before her due date, resulting in her second C-section. Darcy and Phil looked at Kitty, who had just joined them in the living room. Darcy noticed that the tension between the couple was weakening, and the glint in their eyes as they looked at each other told him that there was still hope for them. But something was missing from this picture, something that put all his senses on alert. He didn’t hear anything else and rushed to the kitchen. Darcy paused for a moment before entering. He was concerned, but he would never let Elizabeth see it. All he wanted was to transmit to her the tranquility and confidence she needed to face this new obstacle that life had thrown their way. He saw her by the table, breathing deeply, with both hands on her abdomen. She was chewing her lower lip in the manner she always did when she was nervous. The conversation with Elizabeth’s obstetrician was short. He told Darcy to take her to —— Hospital in London where he would meet them in about three hours. From what he intuited, the labor had not yet started and the mother seemed fine, so there saw no reason to freak out and rush to the hospital. Once at the hospital, Elizabeth was placed in a room. She submitted to all kind of tests to determine if mother and child were all right, and the doctors decided there wasn’t any danger for either of them. Now they only had to wait. The labor started by itself a few hours later. For nearly eight hours, Elizabeth stayed in her room in the company of her husband and was checked on occasion by the midwife and the doctor. They had agreed with Kitty and Phil to not tell anyone except the Bingleys as they didn’t want untimely visitors that would alter the future parents’ peace. When the time came, Elizabeth was taken to the delivery room. “You are coming with me, aren’t you?” Elizabeth held her husband’s hand tightly. “I would never leave you, Elizabeth, never,” Darcy replied reassuringly. The Darcys were blessed with a beautiful baby girl that day. She was tiny, but she was strong and healthy. As they watched her sleep, so perfect yet so fragile, they thought of the long road they had walked to reach this place, of all the obstacles that the clutter of life presented them. Surely there would be a lot more, but they didn’t care, because the ride was effortless and smooth when they took it as a team. Meryton Press is offering eight eBooks copies of Obstacles. The giveaway runs until midnight, September 30, 2018 and readers may enter the drawing by tweeting once a day and daily commenting on a blog post or a review that has a giveaway attached for the tour. Entrants must provide the name of the blog where they commented. If an entrant does not do so, that entry will be disqualified. There will be one winner per contest and each winner will be randomly selected by Rafflecopter. The giveaway is international and to enter it you should click here. I absolutely loved this post. I’m not sure if this is included in the book but I really hope it is. Hopefully Kitty will be ok after a taste of the truth from Elizabeth. Then Darcy and Elizabeth can take their baby daughter home and maybe have a bit of peace to enjoy their little family. I’m so looking forward to this book. I’m as surprised as Rita at how deeply into the Darcys’ relationship this story goes. There must be a lot of story to tell. It is well told. Thanks! I enjoyed this vignette, Belén. Thanks for writing it specially for the blog tour. It’s a perfect ending to an entertaining story. I enjoyed the excerpt and was happy to learn so much about what happens in the story. They face so many trials and yet are so supportive with each another. I read and enjoyed this book.